NHS IVF funding is a complicated story. 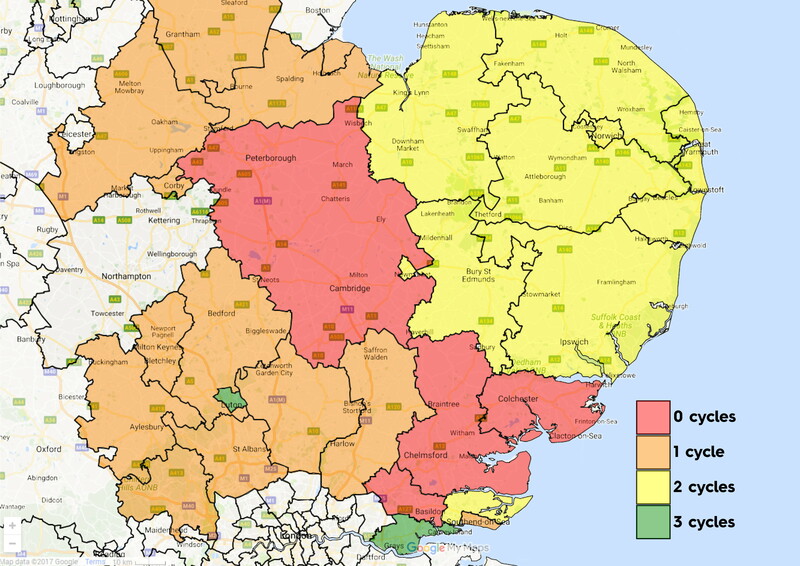 Until 2014 all the Clinical Commissioning Groups (CCGs) in the East of England offered the same level of provision to all eligible patients, which was in line with the NICE recommendation of 3 full cycles* of treatment. Since then the situation has become fragmented, with some CCGs still offering this level of treatment while others have cut the number of cycles or funding altogether. All of this is creating confusion and worry. Fertility Fairness has been keeping a watch on the situation and this map has been produced using its data to show the number of funded cycles in each CCG. To find out which CCG covers your area there is a useful tool on the NHS website. *A cycle includes transfer of both fresh (first attempt) and frozen embryos so several rounds of treatment. Get advice – If you are concerned about your fertility for a limited period we are offering a free Fertility Health and Wellbeing initial consultation with a fertility nurse specialist – just phone 01954 717210 to book your appointment. Get tested – As funding for IVF is cut we also notice that less NHS testing is occurring – a fertility test for you and your partner will reveal if there are any underlying issues; if there are none, then lifestyle advice or a short course of medication to boost your egg production might be sufficient to improve your chances of conception. Fertility tests can be completed within one menstrual cycle and there is no waiting list. Consider your options – IVF might seem an expensive treatment, but the cost can be spread over time or the risk reduced with a money-back guarantee if you are unsuccessful. We have teamed up with Access Fertility to help make treatment more affordable.